Sustainability — Action Janitorial Supplies Ltd.
We believe in offering efficient and sustainable cleaning solutions for our customers. At Action Janitorial Supplies we know the value of a triple bottom line approach to business. This concept means the bottom line is not only dependent on profits, but on maximizing benefits for society and the planet as well. Cleaning chemicals may not be inherently good for the environment but there are ways to decrease the products' overall impact. Our main chemical line, Buckeye International Inc. does this by making their packaging as environmentally friendly as possible. Most of their products are concentrated. This helps decrease the amount of product being shipped and packaging being used. The packaging that is used is fully recyclable. The 4L jugs can be rinsed out and recycled. The 20L sized products come in a plastic bag housed by a cardboard box. The boxes can be broken down and recycled, and the plastic bags can be rinsed out and recycled as well. Many other products that we carry are designed with environmental sustainability in mind too. The mats and garbage containers that we carry are made of recycled bottles. We carry Green Seal Certified toilet tissue and paper towel that is made of 100% recovered paper fibers. 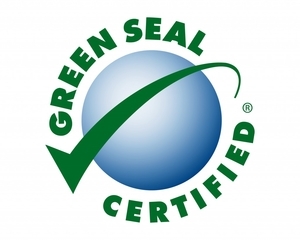 A lot of our other products are Green Seal Certified as well. This trusted third party certification is given to products to prove that they are truly environmentally friendly. For more information on this certification visit their website here.